Different diamond cuts have the most innocent way of complimenting each other. This baguette and brilliant cut diamond ring has a vintage beauty about it with each diamond having its own character. This ring has been crafted out of 18 carat white gold to form the gorgeous vintage structure of the ring. The plain shank works subtly around the ring to meet the unique brilliant cut diamond set shoulders. The shoulders bring character to the ring, the shank has a gradual parting which then rejoins closer to the diamond setting. As the shoulders reach the central setting they taper towards it delicately supporting it. Behind the setting there is detailed pierce decoration which is joined with a petite princess cut diamond. There is then further vintage inspired milgrain decoration placed below the stunning additional diamond. The centre piece of this ring is the use of 5 baguette cut diamonds partnered with 4 individual brilliant cut diamonds. 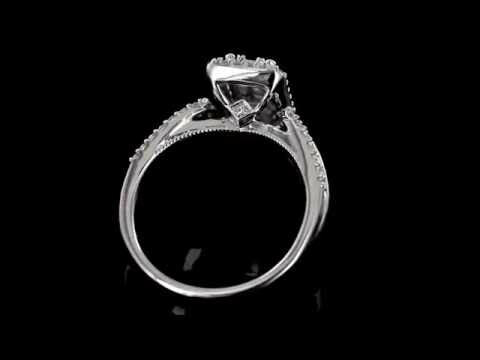 This setting has then been surrounded just a diamond halo to which completes this gorgeous piece. Ring size M. The ring is available in other sizes, please state size required when ordering. If you should have any further questions regarding this ring then please do not hesitate to contact us.